Background and Sources: Lipase enzyme is a naturally occurring enzyme found in the stomach and pancreatic juice. Its function is to digest fats and lipids, helping to maintain correct gallbladder function. Lipase is the one such widely used and versatile enzyme. These enzymes are obtained from animals, plants and as well as from several microorganisms and are sufficiently stable. These are considered as nature’s catalysts, but commercially, only microbial lipases are being used significantly. Applications: They found enormous application in the industries of fat and oil processing, oleochemical industry, food industry, detergents, pulp and paper industry, detergents, environment management, tea processing, biosensors and cosmetics and perfumery. Various recent patents related to lipases have been revised in this review. Conclusion: Lipases are very peculiar as they have the ability to hydrolyse fats into fatty acids and glycerols at the water-lipid interface and can reverse the reaction in non-aqueous media. This natural ability makes it the most widely used enzyme in various industrial applications. This article deals with the immense versatility of lipase enzymes along with the recent advancements done in the various fields related to their purification and mass production in industries. 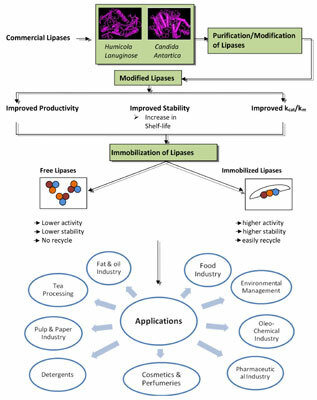 Lipases, enzyme, oleochemical industry, environment management, biosensors, catalysts.